The classic role for the militia was in the Revolutionary War* By the summer of 1775, the Virginia Revolutionary government had established a three part military establishment consisting of regular full-time soldiers, a militia composed of most free white males, and a smaller, elite militia group to be called “minutemen” who were to be given extra training and provided with hunting shirts and leggings. The militia was ineffective when called on to resist external threats. The 1791 second amendment was a sentimental nod to a myth rather than a statement of military reality. The militia’s painfully inadequate and cowardly response to the British invasion in 1812 culminated in Washington being burned down. This destroyed the myth of the citizen, amateur army. The 1878 Possee Comitatus Act** revived militia style arguments for an armed citizenship, “a county sheriff, or other law officer, conscripts any able-bodied man to assist him in keeping the peace.” The ‘posse’ was ineffective despite being a much loved trope of film-makers. Later in the 19th and early 20th century there were racist lynch mobs*** in the Deep South whilst in the ‘wild west’ whites were the usual victims of ‘rough’ justice. This reflected the sense of entitlement, by non-authorised citizens, to mete out extra-judicial murder. The second amendment can’t be held responsible but it provided a fig leaf of respectability for citizens’ rights in matters related to perceived ‘threats’. The infamous Ku Klux Klan acted on the belief they had a right to enforce their opinion of law. The Ku Klux Klan perceived as threats black-Americans, Roman Catholics, Jews and anyone else who gave them offence and who broke the ‘peace’ by virtue of existing. Having broken the peace they suffered extra-judicial murder. In the present day the militia has disappeared. 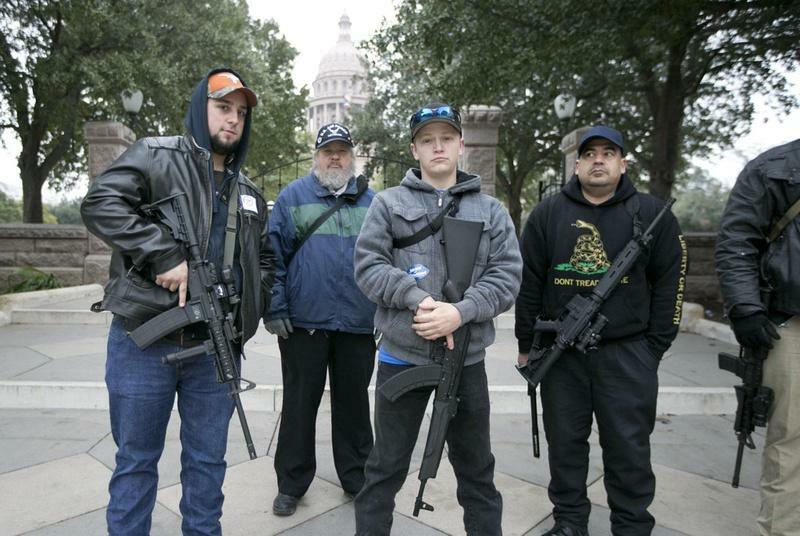 The 5th November 2017 Texas church massacre was halted by armed civilians who behaved as a sort of possee. Johnnie Lagendorff and an unnamed other man chased the assailant who crashed and killed himself. At the other end of the scale is George Zimmerman – a self-appointed community safety officer – who shot black teenager Trayvon Martin in the back. (Zimmerman claimed he acted in self-defence****.) Zimmerman was an unappointed freelance vigilante, or, in his eyes, a community safety officer. Zimmerman didn’t meet the criterion for a possee in the Wild West unlike Lagendorff. Possees operated under rules where their actions were defined by the sheriff. The possee’s role ended when the sheriff said so. Interestingly Zimmerman was found not guilty of both murder and manslaughter despite the fact that he provoked the original interaction. The racist possibilities of that judgement didn’t escape notice and became part of the Black Lives Matter, campaign. The current interpretation of the American constitution on gun laws seems odd. The justification for the second amendment was specious in 1791, never mind the 21st century. Nonetheless powerful commercial interests and lavish support for politicians has retained the right of the population to bear arms. As a sovereign state the USA can make whatever laws it wishes but it seems a quaint way of conducting affairs in the 21st century. The line from the 18th century militia to George Zimmerman is intellectually flawed but is now part of the institutional fabric of the USA. This entry was posted in Economics, History, Politics and tagged 18th century militia, American war of independence, mass-shooting, obsolete concept, Possee. Bookmark the permalink.